Ready to send your invoice to your customer? Use the documents under the Print heading to print, download, or send the document. 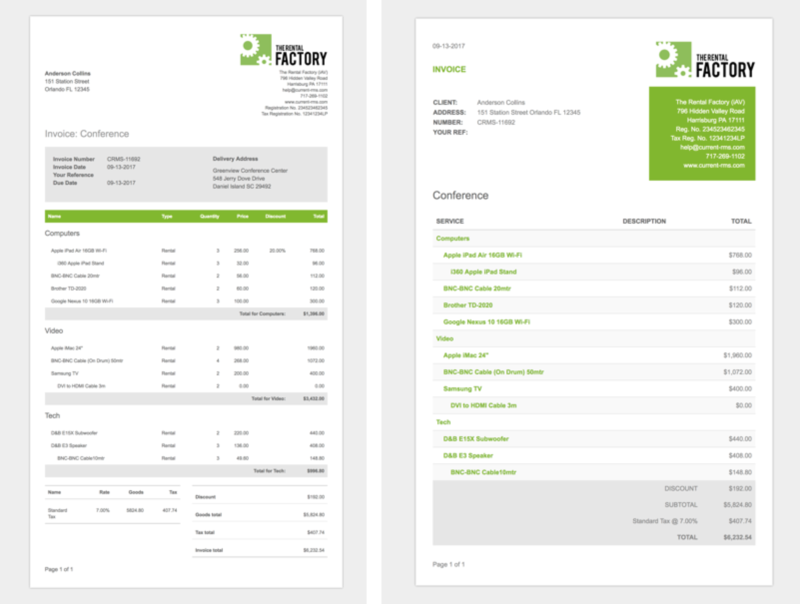 Your Current RMS system comes with two invoice layouts to choose from out-of-the-box. You’ll see any active layouts under the Print heading on the right hand side of the invoice or credit. Click to preview. The same layouts work for both invoices and credits – the title changes depending on the kind of record you’re working with. To print or download your document, click the Print friendly version or Download to PDF buttons at the top. ⚠️ When using the print friendly version, your web browser takes care of some layout and formatting settings for you. For example, you might notice that background colors don’t print or font sizes are slightly different. If you want to be sure that what you see on screen is what you’ll see on paper, downloading to PDF and printing from there is your best option. Downloaded PDFs can be saved to your device for your reference or for sending on in another app. Send an email to your customer from Current RMS by choosing the Create a discussion button. The organization against the invoice will automatically be included as a participant, along with a PDF attachment of the document for your customer. Enter a subject and comment, then select Create Discussion when done. Discussions sent with Current RMS come with email open tracking, so you can often tell when a customer has received an invoice – handy for those times when a client is stalling on payment. Integrated with Xero or QuickBooks Online? You don’t need to send your invoice documents from Current RMS, you may use the options built-in to those solutions too.